Read here latest shayari about feelings of sad and lonely lover. New collection of Poetry about Loneliness, akelapan and Tanhai. Share these Shayari, Sms and Status with friend, girlfriend or boyfriend or set as Facebook or WhatsApp status. 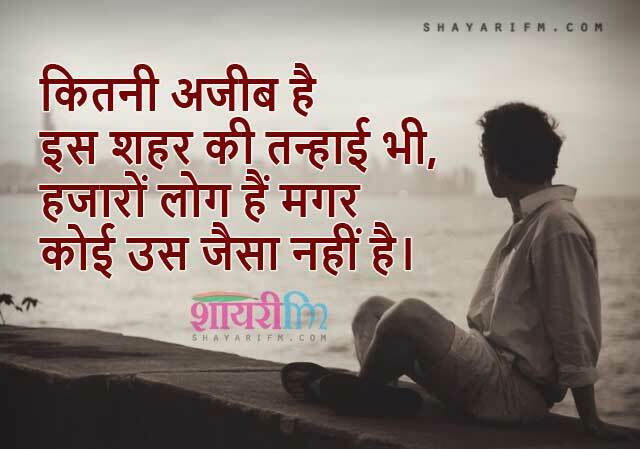 All Best Alone Shayari, Tanhai Shayari and Loneliness Sms available in Hindi and English font both. Jisko Koi Mil Gaya Woh Aur Tanha Ho Gaya. Main Ek Katra Hoon Tanha Toh Bah Nahi Sakta. Main Mazboot Bahut Hoon Lekin Patthar Toh Nahi Hoon. Akele Hi Najar Aaye Hum Jahan-Jahan Se Gujre. Tum Se Bhi Koi Shikayat Na Rahi. Tum Bhi Jo Hote Toh Achcha Hota.